Got busy today and accomplished a lot with getting the greenhouse up! My son was able to help, and we had very little wind, so we really got a lot done. My fingers are sore from all the spring clips, but overall this is coming along nicely. 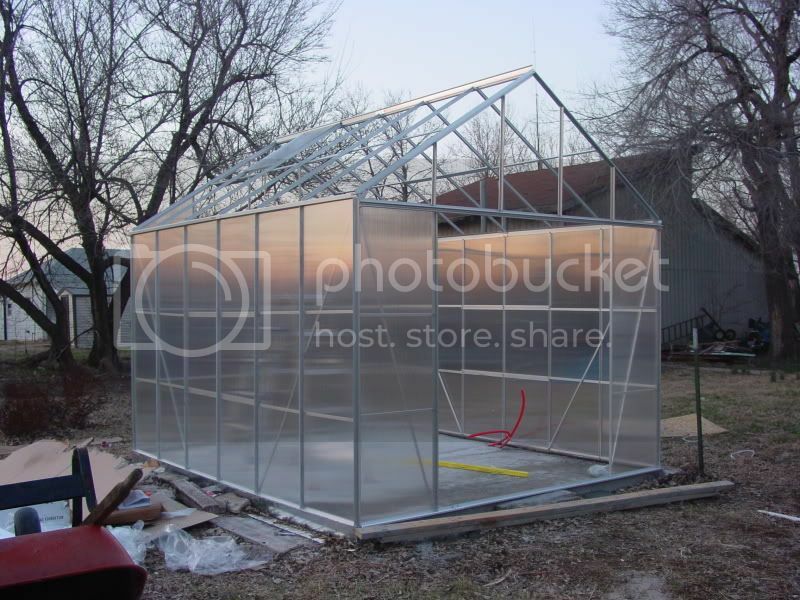 Hopefully I'll be able to finish up the greenhouse tommorrow. i'ts really comming along nicely! Hopefully you will be smarter than I was and figure it out in no time. I hope the Doors are easier than the windows! They seem to fit to tight I am still working on that . Hopefully tommorrow I can finish it up. Harbor frieght is like 60 miles away so I"ll just have to brain it out I guess. That's been the toughest part, there is no Hardware store in this small town (only 125 people) and the nearest store is 30 miles away. So I have to plan carefully and pick up the parts I need after work before the commute home. I hope the Doors are easier than the windows! They seem to fit to tight I am still working on that . . The trick with the doors is that they don't go together like you think that they should. build the outer frame, then lay it face down on the ground. Lay those cross braces down with the smooth side down. If you take a close look you will see that the 2 holes on the frame corispond with the holes in the ends of those cross pieces. As odd as it may seem those holes are what the screws go into... I hope this makes sense. I had 4 people here trying to help me figure out that part... LOL it just didnt seem right according to the directions, I thought that those holes were for the screw heads to fit into or something, I dont remember anymore. Mommyhen you are still so far ahead of me in this hobby, it is I who is jealous! 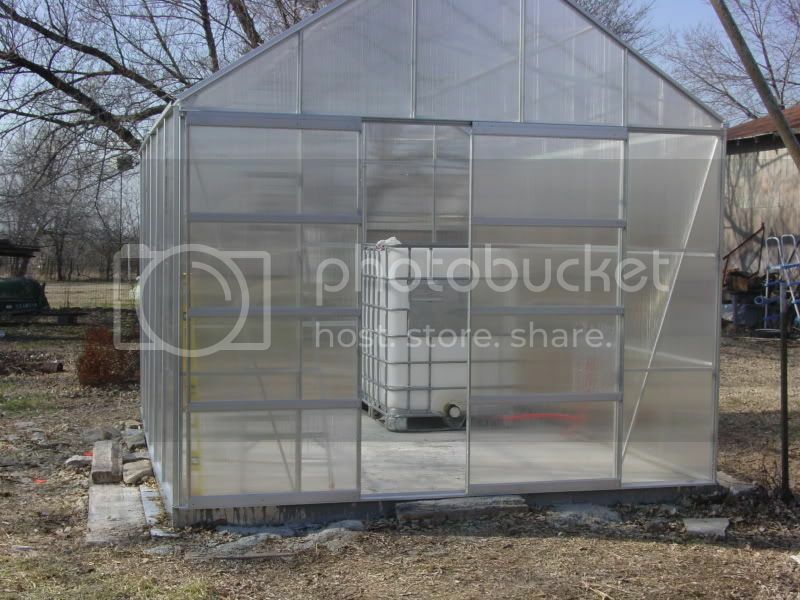 I finished the greenhouse today with a litlle help fom my friend Brett, and was able to move the the 300 gallon IBC that I intend to use as a fish tank into it. Man I am tired! But the since of accomplishment is worth it. I forgot how good it feels to see the results of good hard work! Now I can get down to the business of actually building the system. I can't believe how hard I've been bitten by this hobby. I guess that is because it contains a little bit of everything I like to do. Designing, Construction, gardening and a little science thrown in too. I want your tank... 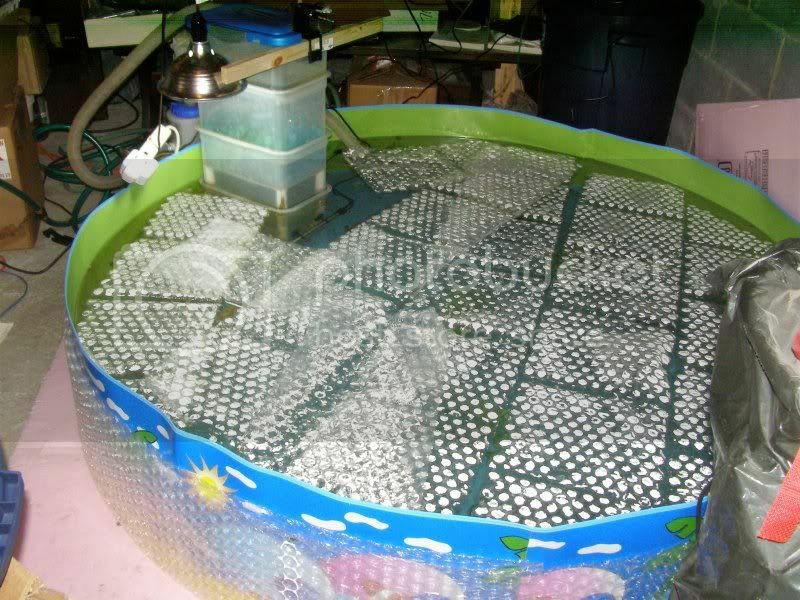 I am dealing with a pewney 60 or 70 gal fishtank in my greenhouse... works great calculation wise for this greenhouse the way I have it set up but as you know keeping the levels correct is harder with smaller tanks. I will be picking up 2 large (for my friends little pond) channel cats that will be going into the 60 gal tub that I have sitting on the side of the greenhouse. I have set up my flat tray riverbeds on a table next to that tub using the tub for the water supply. There are 2 small crappie in there... or at least when I could see in the water there were 2... water is green now and the water grasses have taken over so I don't know if they are still alive or not. The supplier admitted to having problems with their temp tolerance and origonally there were 6. But the tank obviously is devoid of nutrients now because the Romaine looked georgous for the first week, now it is yellowing... I am loathe to get gold fish here from petco as they look starved and few ever survive, seems something is really wrong with them as they dont eat and secumb pretty quickly. most never even make it home and petco is only 1 mile from my house! I am hoping to get some decent feeders from the store my husband used to own while we are at my friends house. Eventually I will drain my swimming pool for cleaning for use this summer. over the winter I have had a dozen bluegill, 2 koi, and several goldies living in there, I was watching the goldies spawn in there over the last 2 weeks. These guys will go into another smaller swimming pool that will eventually be in between 2 home made greenhouses or shade houses, not sure which I will do yet. Perhaps one of each. I have to watch for the smaller pools to come into kmart and target... short of expensive stock tanks that is pretty much my only option... the local feed store wants $375 for a 200 gal rubbermaid and $197 for a 200 gal galvanized. I mail order the 300 gallon kiddie pools. They run under $20 each and last about 2 years. I put foam insulating board under them to make sure nothing sharp bothers them. They are 6' in diameter and just about perfect. This is one I had set up in my basement. The bubble wrap provides insulation.